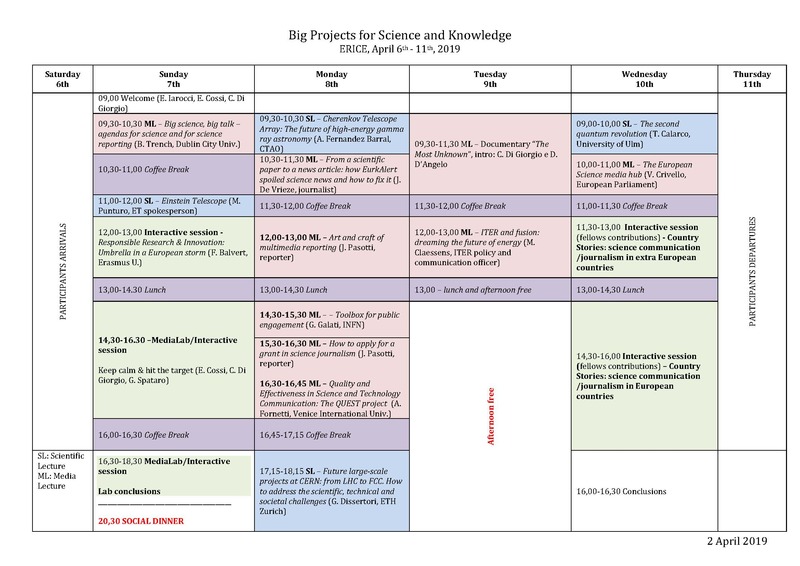 The theme of the 2019 edition of the school is “Big Projects for Science and Knowledge“. All candidates will be informed about the approval or rejection of their application by February 21st, 2019. The course will focus on some outstanding international efforts – such as the Cherenkov Telescope Array, the Einstein Telescope, the Quantum Computing Flagship Initiative and the Future Circular Collider (FCC) – that will be at the heart of the scientific challenges of the next years and decades and motivate the work of journalists and scientific communicators for a long time. As scientific knowledge increases and the boundaries of science move forward, setting increasingly ambitious and complex goals, the development of big science projects – involving hundreds or thousands of scientists from different countries and institutions and the construction of huge facilities – is becoming more and more essential for the achievement of those goals. However, no such project would be feasible without the support of an international public opinion fully aware of the importance of its purpose both from a scientific point of view and from that of the technological, economic and social implications. Close collaboration between scientists and science communicators is therefore more relevant than ever to ensure that information on those issues is accurate, thorough and as broad as possible. The School will be held from April 6th to 11th, 2019.